In the old days, Spiders were used on the top of the rotary table, mounted on a base plate with the elevator bell guides removed. 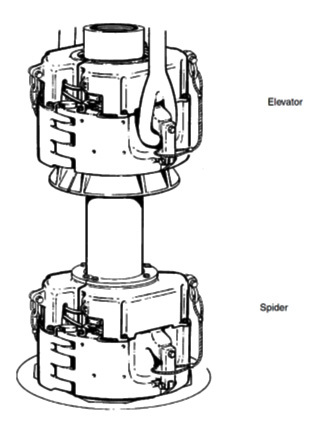 As can be seen on the illustration, the spider would sit on the rotary approximately one meter above the rig floor. This required the need for scaffolding / work platforms for the tong operator to work on. This was not a very safe way to run the casing. Also, the spider (air operated) does not have the capability to provide reaction back up torque, unlike the FMS. The tong operator would require a back-up tong to make up the connections. With the introduction of the Flush Mounted Spider, working at heights was eliminated. As the name suggest: the spider is now mounted flush with the rig floor whereby the connection height is lowered to three feet / one meter. As mentioned, the FMS is hydraulically actuated, providing up to 45K Ft/lbs reactive back up torque. The FMS is easily adapted to the various models of rotary tables on the market. You pull out the Master Bushings and replace them with the FMS. With normal hand slips the weight rate is typically limited to the crush load of the pipe. Some FMS can go up to 1000t, so when it comes to high string-weight jobs, the Flush Mounted Spider is what you will look for. FMS-375 = 4 ½” – 14”, 500t rating, 45,000 Ft/lbs back-up torque. FMS-275 = 2 3/8” – 7 5/8”, 350t rating, 15,000 Ft/lbs back-up torque. The FMS-275 is also hydraulically actuated, and is near flush with the Rotary Table. 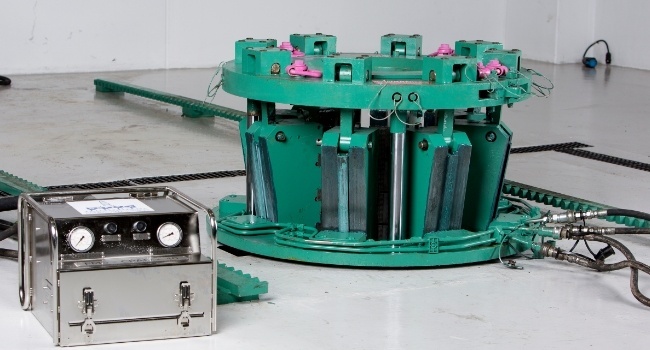 This unit can take up to 6” diameter control lines while running completions. 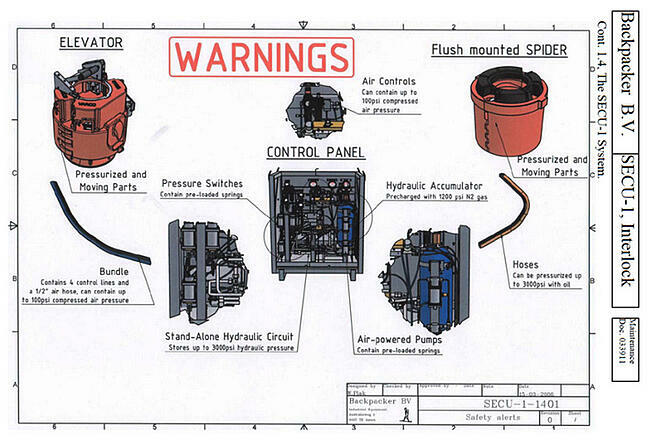 Both of the units can run flush casing. Due to its ability to provide back-up torque the need for a back-up tong is eliminated. The Flush Mounted Spiders can be operated by the driller or the TRS crew. The FMS can be utilized in combination with the Spider Elevators through OWS Advanced Interlock System. This system allows the FMS & S/E to communicate ensuring when either tool is in open position, the other cannot be opened. This prevents accidental human errors and dropping your casing string down the hole. When running casing strings or tubing strings with a Flush Mounted Spider, ensure you install the top guides (running) and bottom guides when pulling. This will ensure the pipe will not hang up on the slips when passing through the FMS. If you are running pipe with centralizers installed, be sure to check the dimensions of the centralizers and the max ID of the Top & Bottom Guides. As I’ve mentioned in my previous blog on Safety Clamps, these should not be used in combination with the FMS. 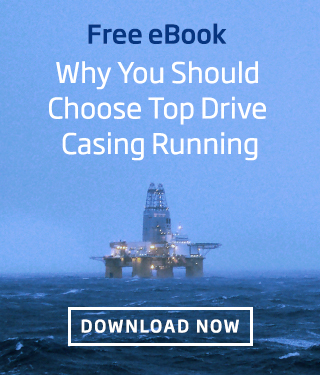 This could potentially cause serious damage to your equipment, and it's a ridiculous habit that must be removed from all drilling rigs. Robert has 15 years experience in tubular running services which comprises pile driving, running casing & high chrome completions, bucking & pressure testing. 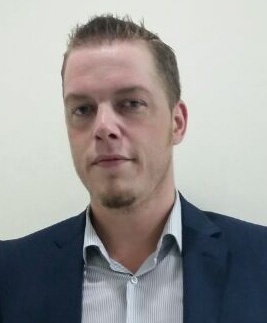 He is an expert on top drive casing running tools & DwC operations (Level 2).